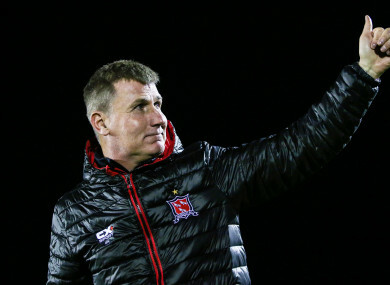 STEPHEN KENNY HAS admitted that it would be the “ultimate honour” to manage the Republic of Ireland, insisting that the job appeals to him more than any other. Kenny has been mentioned as a prominent candidate for the Ireland role, which was vacated yesterday by Martin O’Neill. The Dundalk boss recently steered his club to a League of Ireland and FAI Cup double for the second time since he took over at Oriel Park ahead of the 2013 season. In his six years at the helm, the Lilywhites have enjoyed a remarkable period of success, winning four Premier Division titles, two FAI Cups and two League Cups. “I think managing your country is the ultimate honour,” the 47-year-old Dubliner told the Dundalk Democrat today when asked about being linked to the Ireland job. In spite of such a substantial haul of silverware, Kenny’s most notable achievement as Dundalk manager occurred in 2016, when they reached the group stages of the Europa League. While former manager Mick McCarthy is the favourite with the bookmakers to fill the Ireland vacancy, Kenny has also been strongly endorsed by many pundits. Email “Kenny: Managing Ireland a greater honour than Real Madrid or Barca jobs”. Feedback on “Kenny: Managing Ireland a greater honour than Real Madrid or Barca jobs”.